There are very few things in life that are as satisfying as coming away from a great book with a deep sigh! 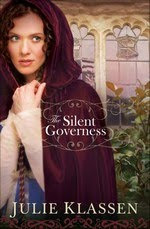 I just finished reading The Silent Governess and absolutely loved it. Julie Klassen is one of my favorite new authors! She's written 3 books over the last couple of years and I have loved each one! I'm not sure if Julie fits in the Regency Fiction category, but she definitely writes historical fiction. Throughout The Silent Governess, I kept being reminded of The Sound of Music. Olivia ends up taking care of children as a Governess although she's never taken care of children. She can't seem to please Lord Bradley, who seems to constantly be annoyed with Olivia and yet at the same time drawn to her. I think one of my favorite moments was when Olivia is giving the children dancing lessons and Lord Bradley comes in and takes over as her partner. Ahhh, sweet satisfaction. I liked that Olivia did as much as she could with the circumstances placed before her. God brought people into her life to make the trials she had to endure a bit easier. Lord Bradley constantly made me want to knock him over the head because he was so frustrating. A sign of Klassen's wonderful writing. I also enjoyed the character of Lord Brightwell. He was such a tender heart later in his life and played a very meaningful role in the story. The Silent Governess left me very satisfied in the end. Even though at 438 pages, it was easy to get through. I can't admit to you how late I stayed up one night I was so engrossed in the story. I honestly couldn't tear myself away. I would give this book away, but I know my oldest daughter will want to read it. Besides, my bookshelf enjoys my Klassen collection. Julie Klassen is a fiction editor with a background in advertising. She has worked in Christian publishing for more than twelve years, in both marketing and editorial capacities. Julie is a graduate of the University of Illinois. She enjoys travel, research, books, BBC period dramas, long hikes, short naps, and coffee with friends. *I'd like to thank Noelle for my review copy of The Silent Governess. If you'd like to learn more about this and other wonderful books, you can visit Bethany House Publishers. 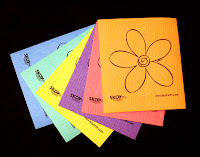 On my quest to find more eco-friendly & family friendly products I came across Wrap-N-Mat. I want to do away with the enormous amount of baggies we use every year. I never reuse them and they just go into the landfills where they sit for an extremely long time. My 10 yr old son is the only one who takes a sandwich or bagel to school for lunch. My 6 yr old always, and I mean always, takes yogurt. So, I had to wait until Buddy had a lunch bag day. It didn't take long. My boys are only so-so fans of school lunches. I made Buddy his regular cinnamon bagel as his main course. They're pretty tall compared to a sandwich so I thought it'd be interesting to see if the velcro would be long enough to seal the Wrap. Ta-da...success! The next hurdle was how he'd react to taking something other than a baggie. You know how kids love to stand out in Middle School, or not. When he came home I kind of, throughout the after school conversation asked him how well his Wrap did. I didn't come out and ask him how he felt about having the Wrap compared to a baggie. He said he liked it and that it stayed cold. I was so thankful. You never know how a 10 yr old is going to act in social situations. I've sent it with him about 4 times in the last couple weeks and I'm happy to say it's made it home in good condition. The velcro is strong enough to stay shut through all the lunch box jostling. Being a boy, Buddy uses it as a weapon. :) He liked the Shark design as well. Very boy! It's super easy to wipe off and lay out for the next day's use. WRAP-N-MAT® Wraps are the only RE-USABLE sandwich wrap and placemat in one. Easy to clean, just hand wash and air dry. Original sized wraps are approx. 13" x 13"
Grande' sized wraps are approx. 14" x 17"
Due to the lining, our WRAP-N-MAT® Wraps are NOT intended for hot foods, to be heated or to be microwaved. As with any plastic, placing hot food upon the lining will make it melt. *I'd like to thank Bonnie from Wrap-A-Mat for sending us our review product. We love it and it's a success at our home! How would you like to have a go at them? Bonnie has sent me the Wrap-N-Mat Wrap and Snack Pouch to share with my commenters! Required Entry: Head to Wrap-N-Mat and tell me which design is your favorite. Must be at least 18 yrs old to enter and a US Resident. There must be a way to contact you either with email or in your contact profile. No email/contact = No entry. Giveaway ends 2/8, 10pm CST. ~Winner has 48 hours to respond to email contact or I will choose another winner. I understand that there are chemicals that are toxic to our bodies in the products that we use. I didn't understand how bad it truly is until I attended a Norwex party Friday night. If you've never heard of Norwex, they are a company started in Norway who's "mission to improve the quality of life by radically reducing the use of chemicals in personal care and cleaning." As Liz, the consultant went through each of her cleaning products and explained how bad the chemicals are in traditional ones, I started sinking more and more into myself. I never understood dryer balls. What was the point? Uh, the point would be to not use dryer sheets that are extremely toxic! WHAT?! We've been using them since I was a kid!! NO MORE! On top of that, I stopped using antipersperant. I've known for a long time that it's bad for us to not sweat. I wasn't that concerned really. I'd wanted to stop using it and actually went looking for just deodorant and couldn't find any. That was several months ago. I stopped cold turkey on Saturday. I actually ordered the Norwex Crystal Deordorant. Thank goodness I'm not a big sweater! So, why am I writing this post? Because I'm really making a committment to changing our lives and the amount of toxins we're putting into it. As a mom, it really freaks me out the chemicals already affecting my kids! The change will take time and research! I want to make sure the claims of companies are true and as safe as they might claim to be. I tend to be pretty cynical and have a hard time trusting large corporations. Let's be honest, everyone is out to make a buck or more. That stated, our lives are worth more than what we're putting into them now chemically! If you have any suggestions or companies that I should try out, let me know! I'm open to ideas. *This post is mine alone and was not to soley promote Norwex. They are mentioned here because of the party I attended on Friday. If you are interested in learning more about Norwex, let me know and I can refer you to someone who sells it. (I don't receive anything from referals). While you're there, take a look around. If you're a blogger who does giveaways, you may want to check in with her and see if you can get on her schedule to be Featured! She has over 1600 followers! Lucky lady. Thank you soooo much Stacie for having me on your site! Another wonderful book from Dr. Warren Widrsbe! He has such amazing insight into God's Word! Some people have the gift of teaching and this man does. He backs up everything he says with Scripture! Dr. Wiersbe shows us through Genesis 25-26 (and supporting scripture) to show us how we still make some of the very same mistakes that they made back in Biblical times. We practice deceit, trechery, look to our own ways, etc. It's so amazing how we don't seem to learn from those who came before us. Even back then they were making the same mistakes their ancestors made right before them. Do you know anyone that does the same thing? It's amazing how our past can follow us so closely we can't discern it from our own present! At the end of each chapter Dr. Wiersbe challenges us to look deeper into what we've just learned and can also be used as a study guide if we're in a small group. I would highly recommend any of the "Be" series along with the Bible that he has. They are spot on! His interpretation of the events bring peace to my heart and urge me to move forward in my faith! After 13 years as the leader of the Promise Keepers movement, Coach Bill McCartney found what he believes to be the priority in the racial reconciliation movement. His new found passion lead to the establishment of a new ministry called The Road to Jerusalem that seeks to reconcile Jewish believers and Gentiles believers worldwide. In Two Minute Warning McCartney unveils the approaching revolutions that God is bringing to His church and how we can adapt to them and embrace them. Each of these revolutions has to do with the Christian church being thrust together with the Jew in the coming days. The last revolution Provision is a wonderful promise of Gods end time protection and provision for any gentile Christian willing to embrace Jews in their end time plight. He uses John 17:20-21 to illustrate that the key to world evangelism is the reconciliation of Jewish and Gentile believers and that until the two are united, Gods power can never be fully expressed in the earth. Although the support of Israel receives broad acceptance from the Christian community, this timely message goes a step beyond and gives a biblical mandate for the Church to support the believing Jew, not just the national and political entity of Israel. Coach Bill McCartney is the former head football coach of the University of Colorado and the founder and former president of Promise Keepers. Currently he is the chairman of The Road to Jerusalem ministry. Aaron David Fruh is a Jewish believer and lead pastor at Knollwood Church in Mobile, Alabama. He is the author of two books The Decree of Esther and The Forgotten Blessing both published by Baker Publishing Group. This was such an interesting and eye opening book to read. First off, let me explain that I am not a theologian. I am far from being a Bible Scholar so there is a lot of cross checking that needs to be done when it comes to the scripture included in this book for me. There was so much referencing I just didn't know! I think many people have heard in recent years that some people are denying the murders of millions of Jews didn't happen under the Nazi regime. How that's possible is beyond me. The Holocaust happened! It would be the same as 30 yrs from now the world denying that the Iraq War ever occurred. We can never let the world change what is true history. As we look back, it's obvious that the Jews have been attacked over and over again. I just never knew how far back this went! When we look at scripture, we see explicitly that the Jewish nation is favored by the Lord. We as Gentiles, not born into the Jewish culture, have been bought by the blood of Christ and are grafted into His family. Throughout the entire Bible it is clear that Jews will be received by God as his Chosen people. What these authors discuss is, what are we going to do when the Jewish nation is attacked again? It's bound to happen. A dog goes back to it's vomit, that's the truth of the matter. What if they are driven out of their homeland again and atrocities are visited upon them? What will you do? What will we, as Americans do? My pastor has always said that God favors those who stand with Israel and I believe that is the truth. If the United States ever turns against those God loves we can expect to see His hand of covering come off of us. I truly believe this. This book was NOT an easy book to read. First of all, you probably noticed that most of my reviews are for fiction. I'm terrible at non-fiction so this book was a challenge to begin with. Then reading the first couple of chapters were so discouraging, looking back at how history has repeated itself time and time again, I wasn't sure how much more I could read. Thankfully after those first few chapters it wasn't so hard to digest what I was reading. Part II was much more encouraging! To me, even though the authors discussed some difficult topics, I thought they did a great job of turning our hearts back to how God wants us to live! There is a lot to digest in this book, but it is soooo very good! I would give this away but it's going to go to my book club leader and then on to my Pastor! He's just going to love this book! I'd like to thank Arielle Roper from Bring It On Communications for my review copy of Two Minute Warning!! She's been so great (and patient) to work with!! "I want to fly like and eagle..."
This is my first time participating in Wordless Wednesday. Probably the only reason I'm able to do it was because I finally had a "great" picture! This was the first game Buddy has made any baskets!! 2008 Christian Writers Guild Operation First Novel Contest! This was an extremely powerful book. I was hooked from the start. Christy starts off this story on a pretty negative note and it doesn't get much better from there. Sure, she wants to do better for herself, but she has such a hard time moving from where she is. May, Christy's sister, is living at a ranch that is about to be taken away from her by the bank. She hasn't heard from her sister since her parents died and lives with a cloud of doubt hanging over her wondering what she did to make her sister leave. Both of these sisters need each other but in different ways. Christy needs May to forgive her but is scared that won't happen, and May needs Christy to feel like she's part of a family. So close, yet so far. Will they ever find what they truly need? I loved that Christy worked at an antique bookstore! I learned about antique books and auctions things I never knew! I loved to frequent these kinds of stores when I lived in WA and even have a few of my own, although I don't know what, if any, their worth is. Sigh...to work at a bookstore like that, what a dream! Of course, on the opposite side of that is May living my dream of being on a working cattle ranch! Lucky girl. Not easy work by any stretch of the imagination, but hard work never killed anyone. C.J. outdid herself in this debut novel. 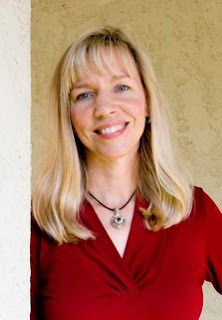 She covers a couple of topics that are rarely seen in Christian fiction. She goes out on a limb and finds success! Her writing is as strong as her characters and very penetrating! C.J. doesn't beat the heck out of you with scripture, but it flows neatly through the story. Thicker Than Blood doesn't leave loose ends and for that I am thankful. With careful attention to detail, emotion, and scene-setting, C.J. Darlington scores with her debut effort. Here is a special writer you won’t want to miss. If you love a good read filled with adventure and ultimately redemption, I encourage you to brew the tea, settle into your favorite chair and pick up the page turner that is C.J. Darlington’s imaginative new novel of a modern day sisterhood that triumphs over separation and the raw challenges of life to find the real endurance of both family ties and God’s amazing grace. With Thicker than Blood, C.J. Darlington proves she's a novelist for the long-haul, a strong new voice in Christian fiction. This book speaks to the heart, from the heart, about the heart. Readers will not soon forget it. C. J. began writing the story that would become Thicker than Blood (her first novel) when she was a fifteen-year-old homeschool student. She has been in the antiquarian bookselling business for over a decade, scouting for stores similar to the one described in the novel before cofounding her own online bookstore. 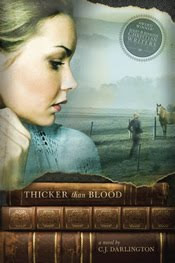 Thicker than Blood was the winner of the 2008 Christian Writers Guild Operation First Novel. 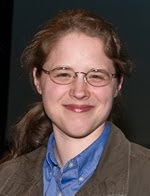 C. J. co-founded the Christian entertainment Web site TitleTrakk.com with her sister, Tracy, and has been actively promoting Christian fiction through book reviews and author interviews. 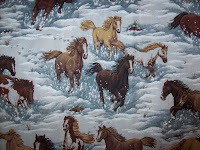 She makes her home in Pennsylvania with her family and their menagerie of dogs and cats. Visit her website http://www.cjdarlington.com/ for more info. More endorsements from Jenny B. Jones, James Scott Bell, Susan Meissner, and more! List of the other 85+ Thicker than Blood blog tour participants! Win Thicker Than Blood! Leave me a comment letting me know if you're a city slicker or more of the ranch hand type. Me, you can stick me in a barn and leave me there! I enjoy visiting the city, but I'm waaaay happier out in the country. Wish I had some cattle and horses though. Must be at least 18 yrs old to enter and a US resident. Make sure there's a way to contact you via your email or contact page. No email/contact = No entry! Void where prohibited. Giveaway ends 2/4/10, 10pm CST. How would you like to start the New Year off with an HP Mini 110-1100 by Studio Tord Boontje PCs? That is what Mom Blogger and 5 time Olympian Dara Torres, and Windows 7 would like to do for you! Check out the video of Dara below for inspiration. She uses the 3.22 lb HP Mini 311 with its full-size keyboard and 11.6” HD screen to balance a grueling training schedule with her family life and work on her upcoming fitness book. She also uses Windows® 7 features like Jumplists, Shake, Snap, and Pin to help her manage all her digital content. I checked these features out at the Windows 7 website and they are so cool! I think I like Peek the most. As moms, we have an avalanche of stuff to do throughout our day. We're moms, employees, wives, taxis, meal & activity planners and so much more. We have to find a way to balance finances, family, friends and free time. When we have that free time, it's nice to be able to spend it enjoying ourselves. Anyone out there a single parent? I am and I know that life can been even more hectic without someone to share the load. I have 4 kids (18, 16, 10, and 6), and it seems that there are very few times I have a breather. There's is always something going on. It would be nice to have a laptop to tote around to use between kids basketball games or during 2 hour practices! Sometimes later at night, it'd be nice to be cozy in my bed with a laptop instead of sitting upstairs at the desk clicking away on my desktop. One way to enjoy and at the same time simplify our lives is to use the HP Mini 110-1100. It has Windows 7 already loaded and ready to go. I love the thought of portability because at this time the only person in my home who owns a laptop is my college age daughter. Personally, I'm stuck at the desk constantly. Speaking of my daughter, since she's in college, she's only been home 2x since August. That's tough on a mom who's had her girl in her life for 18+ years! I'd love to be able to talk with her via the computer instead of the occasional text messages on our phones. My 16 yr old is looking at going out of state for college! Waaaaah! Living in Minne"snow"ta we aren't near any family. My family lives in Virginia and we only get to see them every other Christmas. The boys' aunts and uncles live in Chicago and we try to see them at least once a year. Having a computer with a web cam would make those distances seem so much closer. Think of how great it would've been for my parents to see us all opening their Christmas presents? Now for the good stuff! Dara Torres, Studio Tord Bonntje, and Mom Bloggers Club are giving away 3 HP Mini 110-1100 to three bloggers AND they are also giving away 3 HP Mini 110-1100 to three commenters of all the blogs!! How awesome is that? Leave me a comment letting me know how you'd simplify your life if you had an HP Mini 110-1100. By leaving a comment you are entered into the giveaway! You must be at least 18 yrs old to enter as well as a resident of the US or Canada. Sweepstakes ends January 20, 2010. You must leave a way to contact you if you win either with your contact info in your profile or an email address! NO EMAIL/CONTACT INFO = NO ENTRY! Reader winners will be randomly drawn using Random.org and will be based on the order in which bloggers enter the sweepstakes and post on Twitter. Winners will be announced on Friday, January 29, 2010. I keep saying to those who ask that I didn't make any New Years Resolutions, but I think I did without being intentional. I am determined that by the end of 2010 our home will be more "green". I hope our family will be more conscious of how the products we use impact the world around us. At the end of last year I began using a more eco friendly cleaning products to clean our home. One of my issues was the fact I was using lots of paper towels. That's where the Skoy Cloth stepped in to take over paper towel duty. When they arrived in their cute packaging I wasn't sure I'd be able to use them. I mean, they're waaay cuter than some boring ol' white paper towel. On top of that, using them meant I got to c-l-e-a-n which just isn't my cup of tea. Let's be honest here. Maybe cleaning products, regardless of how cute they are, aren't the direction I should go. My house will end up being clean and I won't know what to do with it! hahahahaha Thanks a lot to Michelle at Skoy who made all this fabulous cleaning possible by sending me my very own set! My aunt came over this weekend and that meant we had to bust a move and get the house cleaned as fast as possible. I'm a disorganized cleaner and this is definitely one area that the Skoy came in handy. When I start cleaning, especially in a mad dash, I tend to forget to to empty out the trash of the overflowing paper towels, signs of my last minute clean up. NO MORE! I walked around rinsing out my Skoy Cloth and using it over and over again. It was so awesome. In the bathroom, all I used to wipe down the mirror was a squeezed out Skoy. Absolutely no streaks unlike using a spray and my extrememly cheap paper towels. 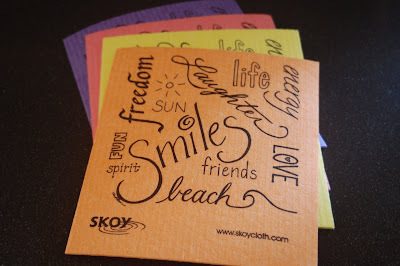 This one Skoy Cloth is going to be used over and over again unlike an entire paper towel roll to clean one bathroom. My one request is that they make one that's black so I can use it on the toilet. *grin* I don't want to use my pastel, cute Skoy Cloth on the nasty toilets (I have 2 little boys who miss)! Today I'm going to head into the living room and start some dusting at the computer desk and entertainment center. Ah, cleaning, it can be fun. REQUIRED: Head to Skoy, and tell me which set you would enjoy trying. Leave me a comment letting me know. This will be your entry. Must be at least 18 to enter and a US resident. Leave your email address or have it available in your contact profile. No email/contact = No entry. Giveaway ends February 2, 2010, 10pm CST. It's been a long time since my family went to Disney World. Before I lived in MN I didn't understand why families went out of town in the winter. We just didn't have that in Washington. After being here in MN for several years and enduring these loooong winters, I finally understood! If memory serves me correctly, we've been to Disney World 2x in the past 10 yrs. What an amazing experience. I'm so thankful my kids were never afraid of the characters! It was so fun watching them go up to any one of them and ask for an autograph and have me take their pictures. We've always gone with the extended family: aunts, uncles, cousins and grandparents. We definitely did the Hopper passes which allow you to from one World to the next. We would do Disney for a couple days, take a break and do it again for another 2 days. The memories we have are priceless. I had Doodle's first hair cut at Magic Kingdom. He got Mickey Ears that said "First Hair Cut" on the back!! It was so awesome! And if you can, have at least one Dining Experience. That was such a great time with the characters! 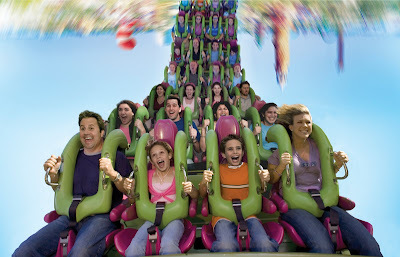 Get a FastPass for rides you really want to ride so you know for sure you get to ride. This is especially a great idea for a packed World! I think the most important aspect of visting Disney World is to have a plan, but be flexible. I was the world "planner". Know what rides you want to go on and if you can all go (depending on height). What shows do you want to catch if any? Which rides allow the parents to take turns? I got my Disney travel books from the library and made lists of how to do things. They have amazing short cuts and ideas to make vi sting Disney a more fulfilling experience. If you use DestinationsinFlorida.com, get tips from them! They've been doing this long enough to have some great ideas! That's what they're there for. Are you thinking about getting away from the winter doldrums and having a fantastic time? Then head to DestinationsinFlorida.com. They have some fantastic deals for families who want to head south and have a fun vacation! Doesn't a Disney Beach Vacation sound divine right about now? My readers should mention they found out about this at Woven by Words or mention the rate code Mommy when pricing their trip, so the agents know to offer this extra discount and free perks. The promotion for my readers includes a special discount off Disney World packages. Plus, with any Disney World Package, you will receive a special Mommy Pack. The Mommy Pack includes a Disney Park autograph book (one per child), one Mickey Mouse ears hat, and autograph pictures (personalized to each child and signed by Mickey Mouse). These Disney souvenirs are right from Magic Kingdom Park. This special goodie is only available for our Mommy Blogger participants and their readers. DestinationsinFlorida.com will provide the prize. 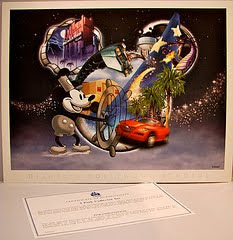 The prize is a set of 4 Disney Parks limited edition lithographs featuring special attractions from each Disney Park (Magic Kingdom, Epcot, Disney's Hollywood Studios, and Disney's Animal Kingdom Theme Park) and Mickey Mouse. Tinkerbell also spreads pixie dust through all of the lithographs and makes an appearance at the last lithograph with Mickey. These lithographs sold at the Disney Theme Parks for $75. 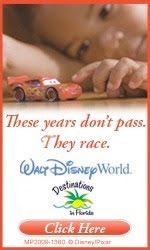 Enter to Win: Leave me a comment letting me know if you've been to Disney World before. Must be at least 18 yrs old to enter and a US resident. I must have a way to contact you if you win so...leave your email address or have it accessible in your contact information. No email/contact = No entry! Void where prohibited. Giveaway ends 2/1/10, 10pm CST. As part of my decision to do away with shopping bags I turned to b. happybags to see if their bags would be the way to go. Ooooh, I am so happy to say, "THEY ARE!" Mary Kay sent me 4 bags. Thank you sooo much Mary Kay! Let me tell you, the restraint I am using by not breaking into the 2 I'm going to giveaway is quickly crumbling! I will try and keep my review of these bags brief, but I really do love them. When I pulled them out of the box, I thought they were pretty small. That's because they're folded up well. *grin* When you open these bags up, they become huge. They expand to a size you won't believe until you see them. My 18 yr old daughter and I went shopping after we had our pedicure and I wasn't sure how it was going to feel bringing in my own bags. I've never done something like this before. I felt so granola! hahahaha It was a good feeling, let me tell you. I knew I wouldn't be walking out of the grocery store with a cart load of plastic bags. Ok, so the bags above: the first one is a SIDE view, yes side view. Can you see how wide they get?! And obviously the next two pictures are of the inside of my bags to show you how much weight they can carry and how much you can get in to just one bag! I had to explain to the kid at the check out that I was using my own bags. He seemed a bit dubious, but he piled my groceries in. All my cold products went into one bag and when I went to lift it, I honestly thought it was going to snap the handles off my brand new bag! It was so heavy. I'm NOT kidding. I figured, may as well get it over and done with. If the handles are going to break under this load, at least it will be an honest review. Not a problem for my Dolley bag! It held up under the strain. Then I told Baby to smile so I could take her picture while I was grabbing my groceries. She was thrilled compliant. My pizza box fit perfectly. The amount that fit in each bag was fantastic. 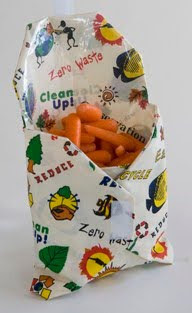 I would've gone home with at least 2 plastic bags (minimum) for each of my reusable bags from b. happybags. That was only in this light shopping trip. It's happened again. A fabulous company, b. happybags has offered my visitors a coupon code!! AGH!! I'm so excited! 50% off!! FIFTY PERCENT OFF! How amazingly generous is that? The coupon code is case sensitive so make sure you enter it as all lower case "wovenbywords"! Enjoy! Expires 2/15 Buy one for someone you LOVE! REQUIREMENT: Visit b. happybags and tell me which bag you would exchange your plastic and paper bags for. Must be 18 yrs or older and a resident of the US. Leave a way to contact you either with your email or profile contact. No email/contact = no entry! Giveaway ends 1/28, 10pm CST. Void where prohibited. Extra Entries Requirement MUST be complete before any extra entries count!